The GPS specialist brand Garmin, has announced a new GPS watch which has been specifically designed for outdoor enthusiasts; for example climbers, mountaineers, hikers and geocachers. The new Garmin Fenix has very advanced navigation capabilities in a similar vein to traditional GPS handhelds and comes with an altimeter, barometer and compass suitable for outdoor use. When you use the Garmin Fenix you can make your way along digital markets, tracks and waypoints as your current route is shown on the watch face display, offering a beep and vibration alert so you know when you need to change direction. Alternatively you can choose to navigate based on the TrackBack feature. This means you will never lose the way as it records each step you take so you can easily return to base or camp, regardless of how rough the terrain. All digital tracks on the Fenix watch can be managed and edited, and it is also possible to create new waypoints using the BaseCamp software. The built in barometric altimeter is similar to the 3-axis compass as it works off GPS data calibration. This lets the user keep an eye on their elevation levels, which is an essential function for mountaineers and climbers. All the different functions are controlled via buttons on the watch, the display is unfortunately not a touch screen device. The Garmin Fenix has multiple screens with three different sets of data on each page. Users can choose from over 50 different data settings such as time, distance to the target, direction, or their actual altitude. It doesn’t just have to be for hiking or climbing though as you can also use the Fenix for fitness training due to the additional 30 parameters that include items such as pulse and heart rate. Such features already exist in the Garmin Forerunner range, and are similar on the Fenix in terms of the user experience. Not only that as the Garmin Fenix outdoor watch is also suitable for geocaching and supports various functions for paperless geocaching, the new outdoor treasure hunt activity suitable for families. Because the Garmin Fenix comes with a simple two-tone monochrome screen, it is not possible to display maps. Instead waypoints, routes, and tracks can be sent via Bluetooth to a smartphone or PC where you can view instead. It is also possible to synchronize data using Garmin ANT+ compatible devices to such as their existing handheld range including the eTrex and Montana. The Garmin Fenix is well protected from the elements too as the watch housing is made of steel with reinforced plastic. The watch face display is scratch resistant and made from durable mineral glass. Even underwater you have nothing to fear, because the Fenix is waterproof up to 50 meters deep. In standard GPS mode, the battery of the Fenix runs to a maximum 16 hours, whilst in energy saving mode you can expect to get 50 hours of use. If you simply use it as a watch then the battery life extends further to 6 weeks. 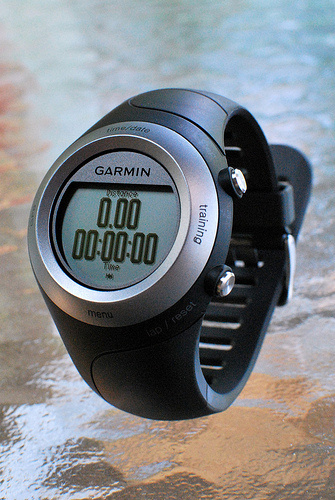 Garmin plan to release the Fenix in September 2012 with a suggested retail price of $399 US Dollars, and the same in Euros. Additional Information: This news release was compiled by Peter B who runs an independent Garmin Fenix review website. Click here for more details on the new Garmin Fenix GPS watch.